If you require emergency service, call us 24/7 at (503) 473-8733 and let us know your needs. If your calling after hours or on the weekend your call will be taken by a call service. However, do not think that your call will be simply dismissed, we have a system in place to make sure your call is delivered to us. For instance, the call service will take your information and then immediately forward your message to us. The Pacific Northwest is notorious for producing big storms that cause structural damage to homes and businesses. For over 23 years Arbor Pro Tree Experts has been helping homeowners navigate the complexities of insurance paperwork. After the storm has passed, assessment of tree damage on your property or your neighbors’ property is needed. 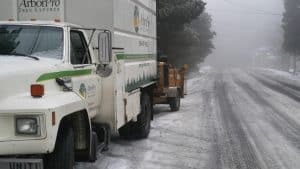 ArborPro is available to help in the immediate aftermath of the damage and provide longer-term solutions for future prevention. Storm damage from fallen trees will happen. 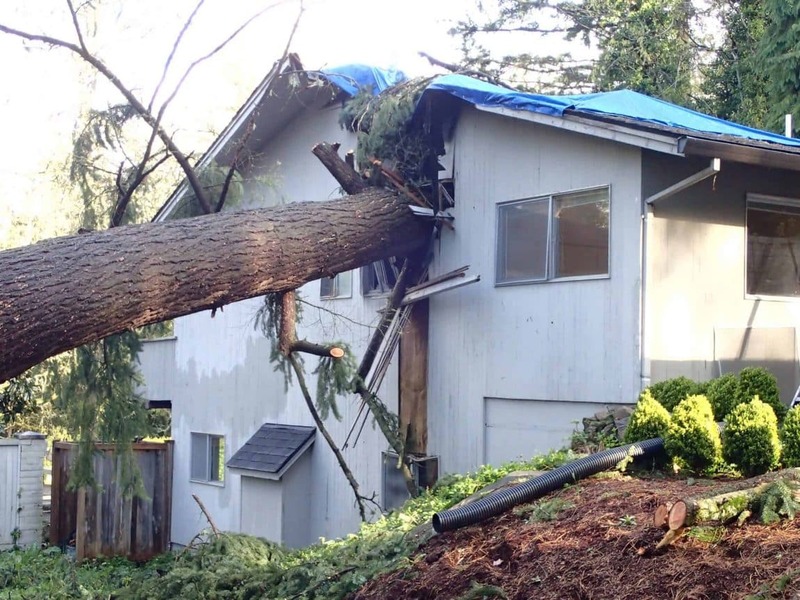 Unfortunately, tree damage from storms can affect your property or your neighbors. ArborPro Tree Experts has the experience, manpower (just a term as we have women employees), proper equipment including cranes. A professionally trained arborist, for example, will help make sure further property damage is avoided. Removing a tree from a structure is delicate and should only be performed by trained professionals. Tree limbs in the Northwest are often times called Widow Makers. The forces of nature like high winds might cause trees to sway and jostle around. Movement of trees often times causes trees limbs high up in the tree’s canopy to become fractured and unstable. As a result, you may or may not see tree limbs that pose a danger to your property and the people below. A proper tree assessment of damaged tree limbs is vital. The process of removing tree limbs from windstorms should only be performed by certified professionals. ArborPro Tree Experts works with a group of select contractors. 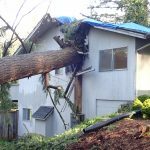 If a tree has damaged a structure, the tree must be removed first and then a licensed contractor can put the band-aid on the damage until a full assessment and plan can be developed. You can rest assured that a crew will be deployed quickly if needed. Your team of consulting arborists can also handle any damage or hazard reports needed.